While she didn’t need a wheelchair that day, her post is a reminder to not rush to judgment without knowing the full story. “A disability doesn’t always mean a person has to be wheelchair bound,” says Justine in her post, “but lucky for you I one day will be.” The National MS Society reports that roughly 2.3 million people live with the disease worldwide. Mayo Clinic lists some common symptoms of MS, including numbness of limbs, partial or complete loss of vision, fatigue, and slurred speech. 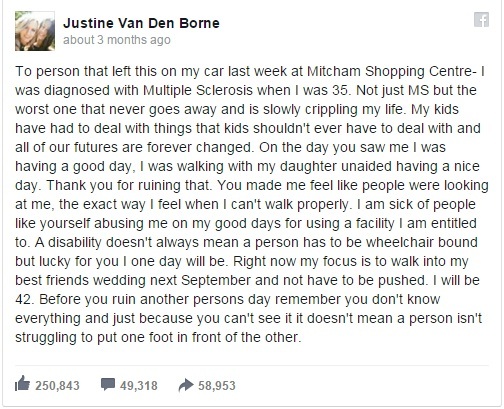 So, no, on that day Justine wasn’t showing visible MS symptoms to others. She wasn’t using a wheelchair, and allegedly she didn’t seem fatigued while walking with her daughter unaided. To Justine, just that simple act constitutes “having a good day”, something most of us take for granted. She didn’t “forget her wheelchair,” she was trying to be like any other mother with her daughter. 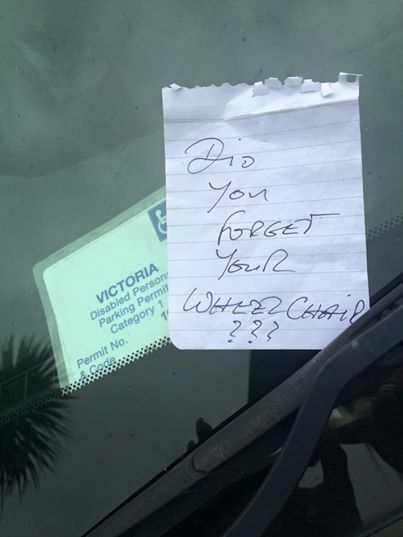 Her full response to the note can be read below. Powerful words from a strong mother, indeed. Please use this as a good reminder to not rush into judgment without knowing the full story – looks can often be deceiving.